Let us care for your Wordpress! Wordpress is a very powerful platform, but it needs constant monitoring and someone to deal with various updates and repairs. If your website has more functions and abilities than the standard Wordpress template, you have probably seen how updating plugins, add-ons or Wordpress itself tends to make the website dysfunctional and lose much of its initial functionality. To avoid these kinds of surprises, we offer our customers a monthly service plan, which includes site monitoring and applying all necessary updates. This service allows you to focus on your agenda and be sure the website works just as you want it to. Why should you consider our service? Safety – updates are the easiest way to avoid security risks that come with outdated software. Future – any new developments on the website are cheaper and faster to make; a well-serviced website has no flaws, and features the freshest plugins and system updates. You can be sure your site is run by the newest and most powerful Wordpress version. Peace of mind – your website is your business card and sales channel. You can be sure it is always accessible and any threats are quickly taken care of. How much will this safety and peace of mind cost? We assess every website separately – it depends on the complexity of the site and the solutions used. The sites previously created by us can be assessed immediately. If you wish us to assess a page that was created elsewhere, we will start with a simple monitoring, get acquainted with the site’s health, and present a list of necessary fixes. Once these have been approved by you and applied by us, we will complete all necessary updates and start with the service period. The shortest service period available is 6 months. For more information, send us an e-mail to hello@sviiter.ee. Erkki is founder and AD, who has been with Sviiter since its first steps. Erkki is with economy degree but with great passion for art & design. 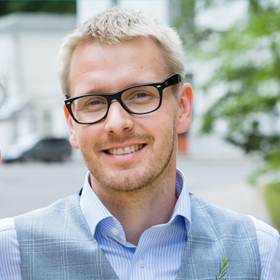 He has been a mentor in Ajujaht, manager of Innovation Year and helped to build Education Innovation Centre in Tallinn University.